One of the bikes I wanted most as a kid was a Slingshot. They were so different and cool looking. 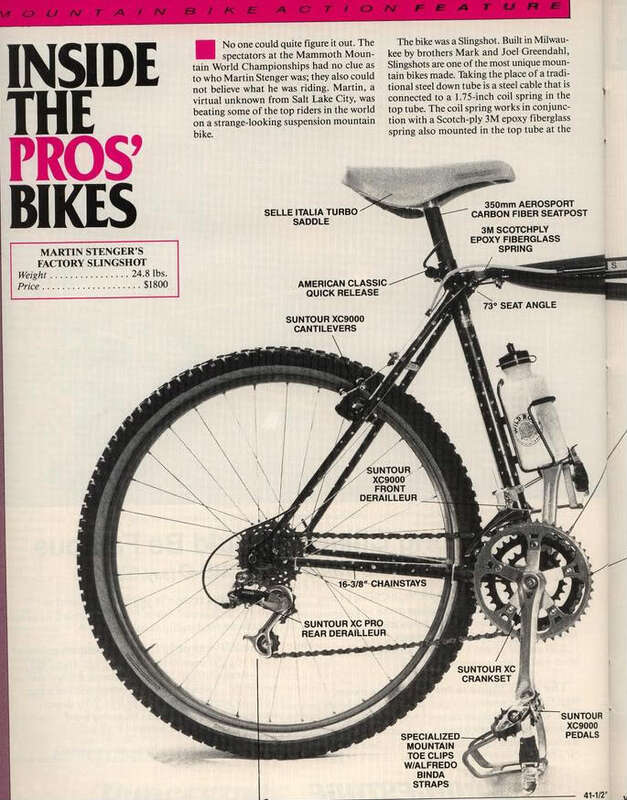 I remember trying one out at Another Bike Shop in Santa Cruz, CA back sometime in 1990. I spent the next ten years on a Stumpjumper instead. 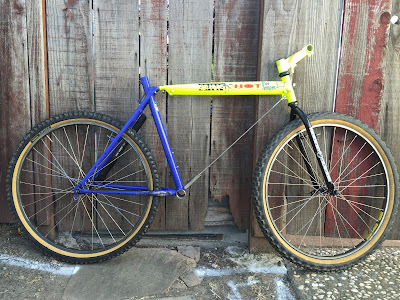 It wasn't until I started acquiring vintage mountain bikes that I set my sights on the missed connection. I've owned at least eight different Slingshots of various years. 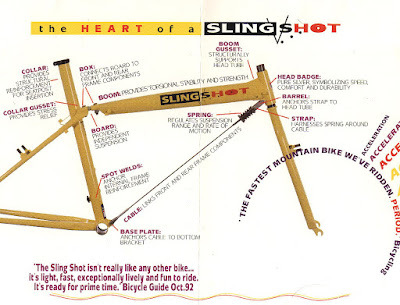 One thing Slingshot did a lot of in the late 80's and early 90's was frame design changes. I see a lot of people often unsure of the year of their Slingshot. Hopefully this guide of year over year frame changes will be useful in identifying your bike. 1985/1986: This was the first year(s) for the Slingshot mountain bike. 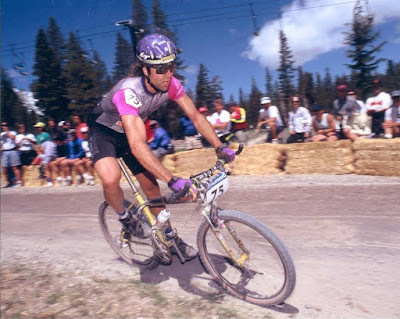 These bikes more closely resemble the construction of the BMX bike. The flexboard section is generally pretty crude. Flat plates accompany the triple top tube and twin spring/cable set up. These bikes also use a 1" BMX headset. Flat plate cable anchor point, 1" BMX headset. Crude flex plate section, triple top tube. 1987/88: One year in to production and there were already big changes happening to the design features of the frame. The triple top tube went away as did the two flat cable anchor plates. 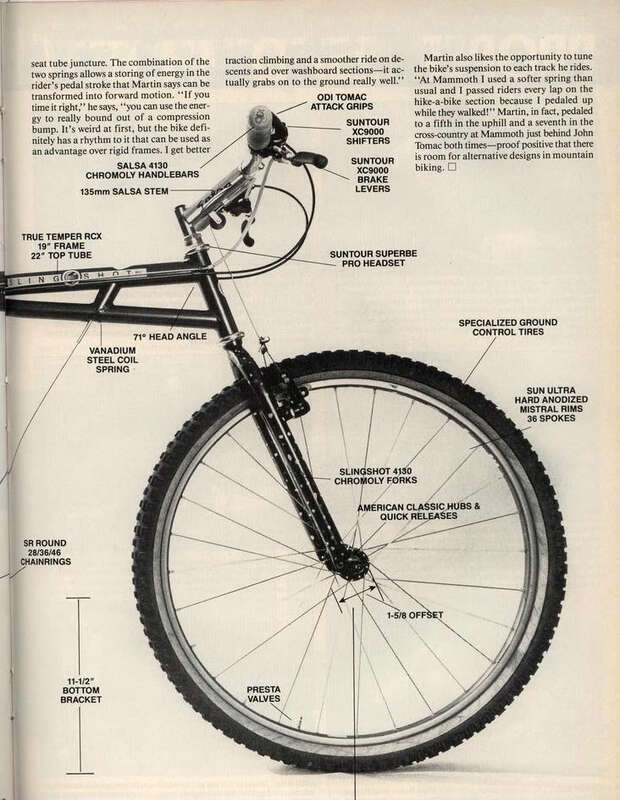 The flex board section of the frame was greatly improved Frames were still produced with double cables and using a BMX 1" headset. 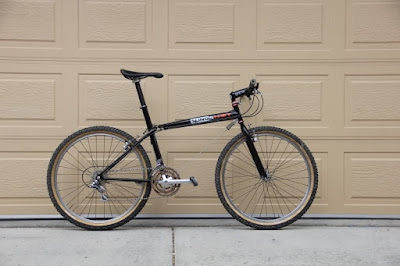 Decals are the 1st gen 'SlingShot' decal also carried over from the BMX. Single tube upper cable anchor, double top tube, 1st gen decals. Lower double cable spring anchor point. 1989: When exactly these next changes took place is a gray area as I haven't seen any definitive 1988 Slingshots. They possibly trickled in late 88 but for the 1989 season, more changes are seen for that year. Gone are the twin cables in lieu of a single cable format. 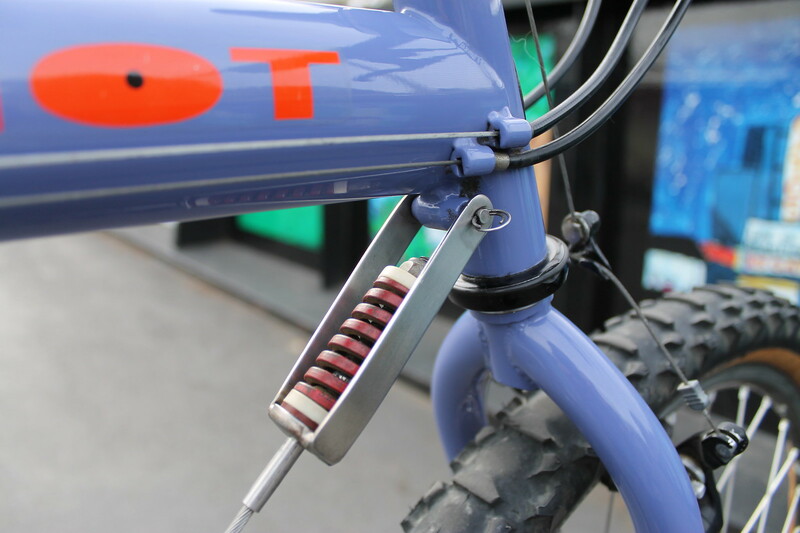 The spring is relocated to inside the previous top tube anchor point between the upper and lower tube. Frames now accept a standard 1" headset. 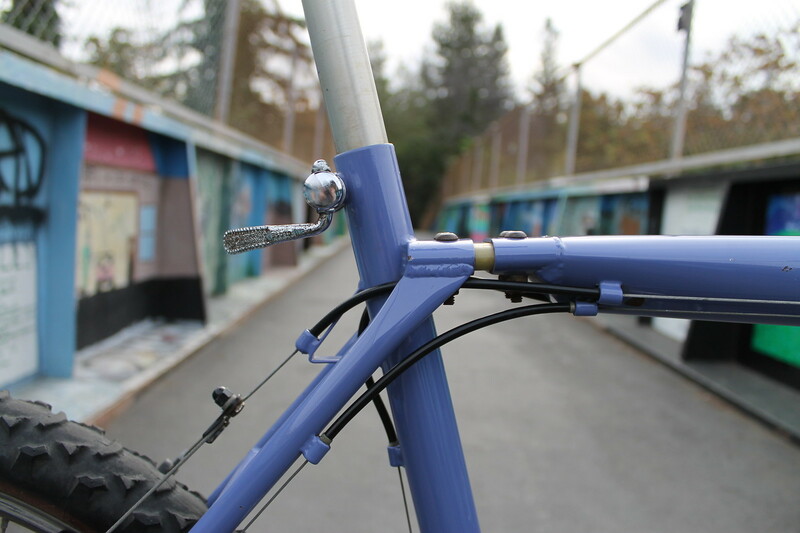 Curved forks give way to the Slingshot straight blade fork. Introduction of the 2nd gen decal. 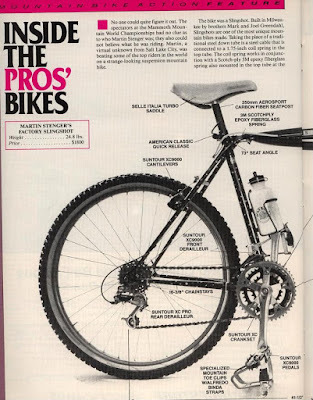 MBAction (Apr 90) Inside The Pros Bikes, Martin Stenger's race bike from the 89 season. 1990: Wasn't long before the spring location was moved back to the bottom bracket. 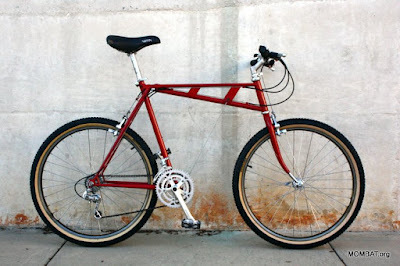 Double top tube was simplified with the upper cable anchor point at the headtube. 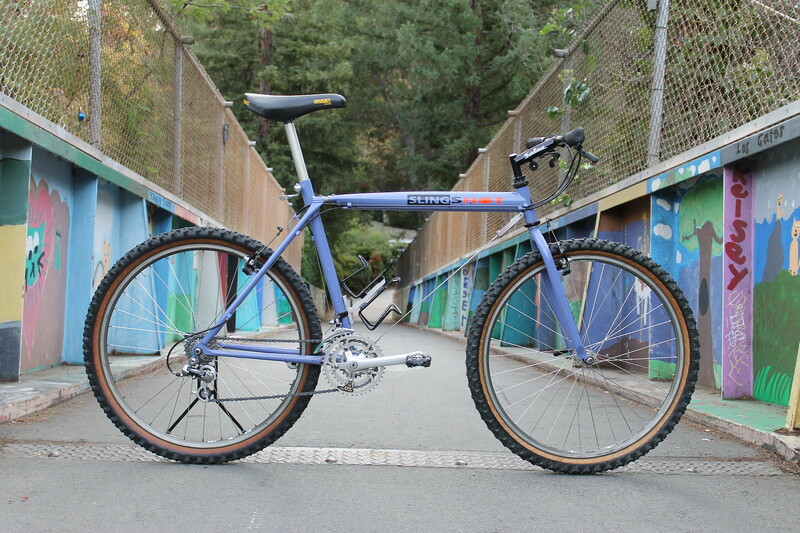 2nd gen decals, 1" headtube, straight blade fork all remain. Headtube anchor point, 2nd gen decal. 1990.5/1991: The reason you don't see many early 1990 Slingshots is because halfway through the year, a big change came with the introduction of the Boom Tube. 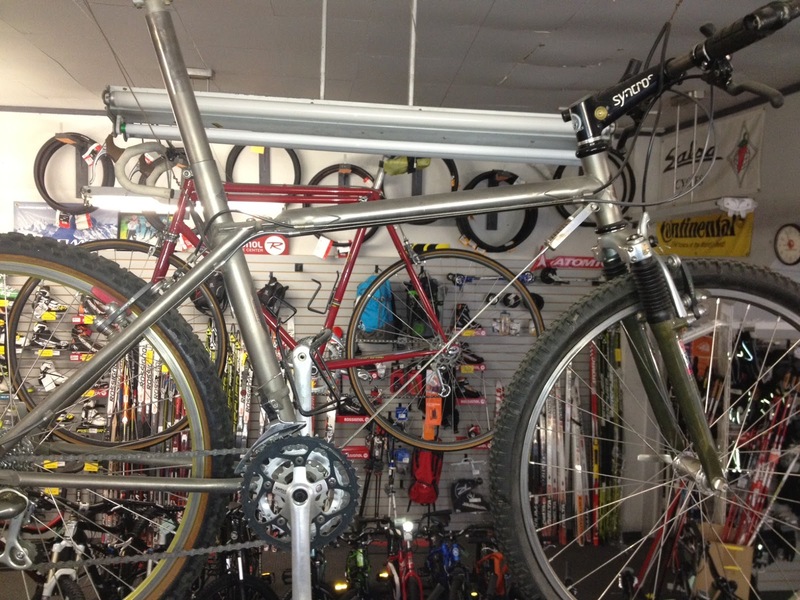 Double top tube is gone, spring location remains at the bottom bracket. Now that they have all this space for the frame decal, something new needed to be designed to fill this space. This is why you see block decals on the early Boom Tube bikes and by later in the ear, the 3rd gen decal makes it's first appearance as does the solid silver headbadge. 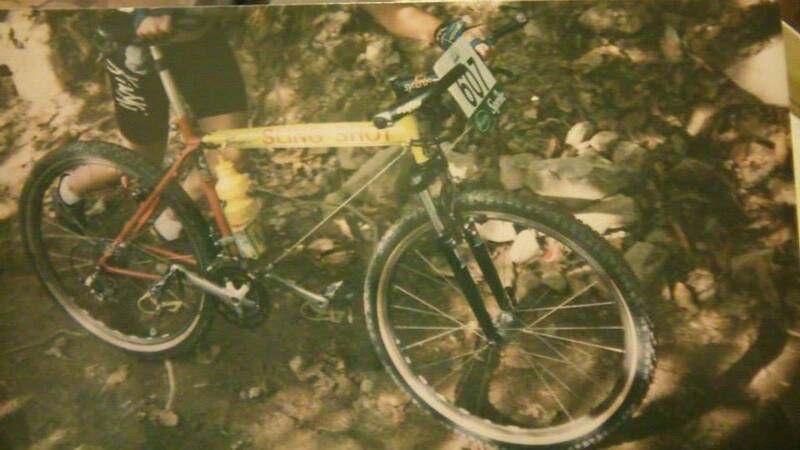 Later 1990 (possibly early 91) with the new 3rd gen SlingsHOT decal (this frame also running team 'True Temper' decals as well as previous 2nd gen decals on the fork). 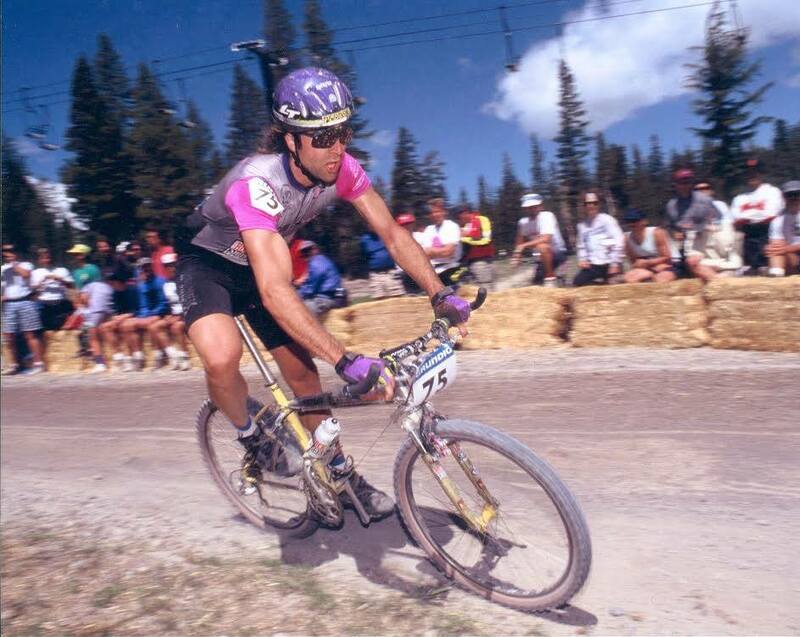 1991.5/1992: The main change for 1991 is the relocating of the spring back to the headtube. 3rd gen decal, solid silver headbadge. Flex board, integrated seat binder. 1992: As we dip in to 1992, the only real change is the integrated seat binder changes to a slip on collar. Flex board, slip on collar. 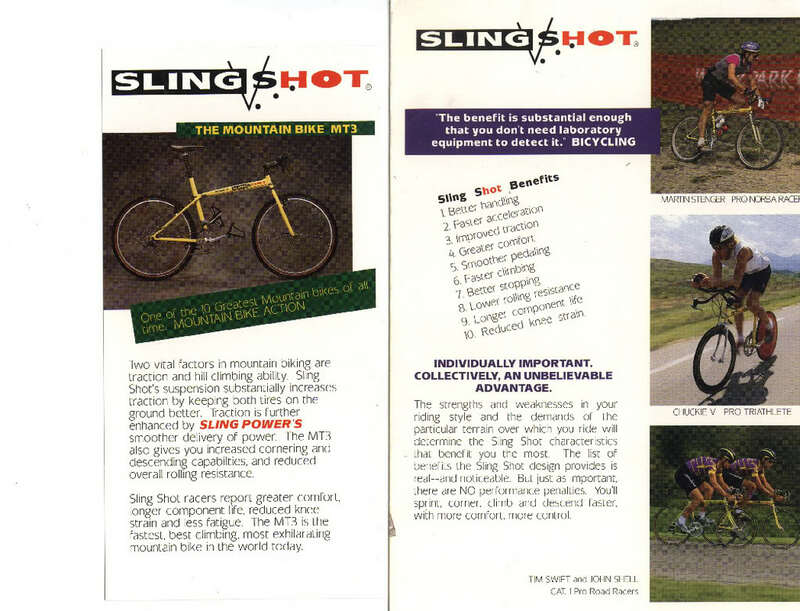 1993/1994: The big change for the 93 season, in my opinion, marks the high point for Slingshot. 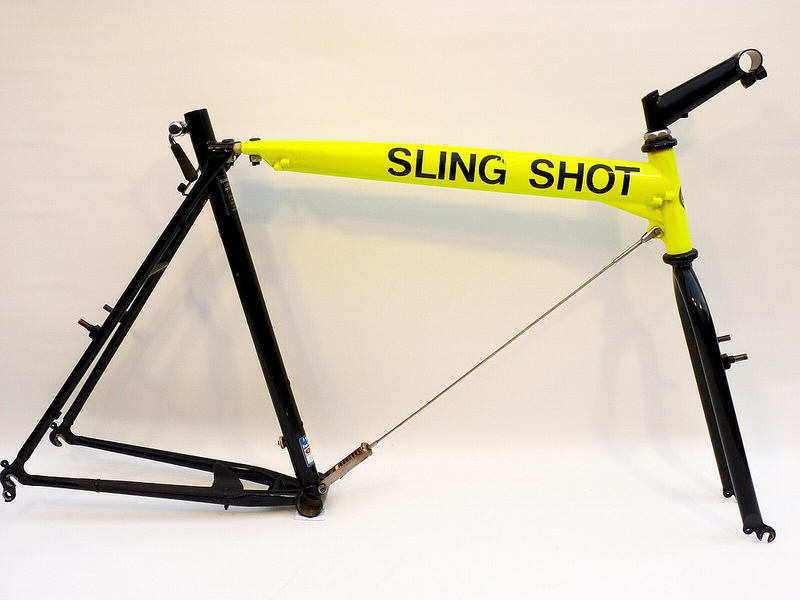 Slingshot moves to a larger diameter seat tube and sloping top tube. Stiffness is increased and the 'stink bug' under braking effect is muted with the new lower flex point. You can still get the wonderful rigid Slingshot straight blade fork, solid silver headbadge, and 3rd gen decals. 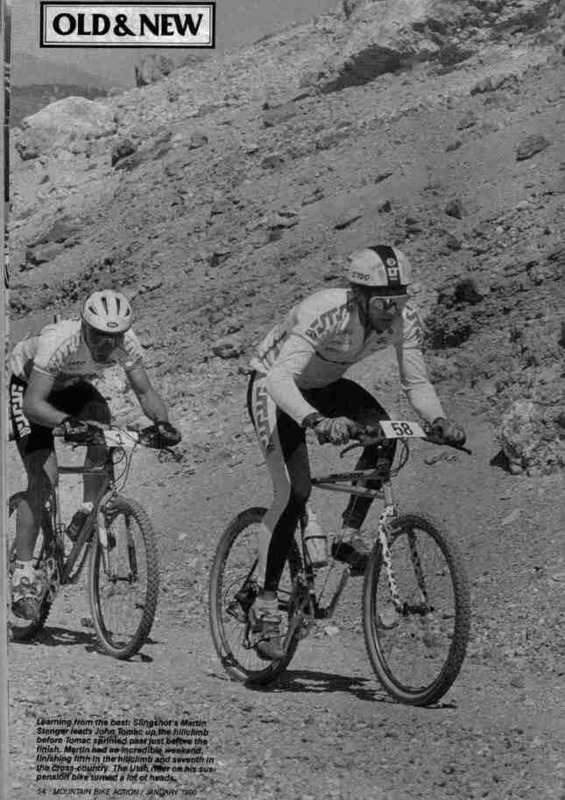 1995: Slingshot design is unchanged, but we lose the solid silver headbadge and the 4th gen decals make their first appearance. 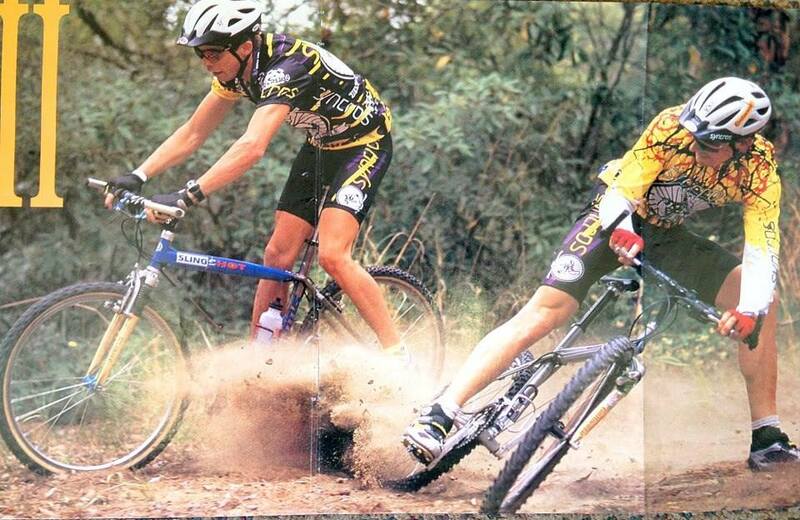 From here there's no real reason to continue down the line as we move into limbo era mountain bikes of the late 90s. Odds and ends. Titanium Slingshots and the world famous Martin Stenger. Mike Augspuger/One-Off made 1 of 1 Titanium Slingshot. A Titus made 1/2 Ti Slingshot and full Ti Slingshot. There are a few out there. 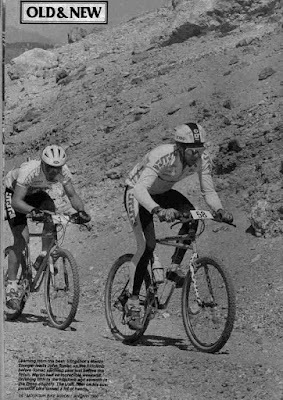 1988 Stenger leads Tomac on a climb at Mammoth. 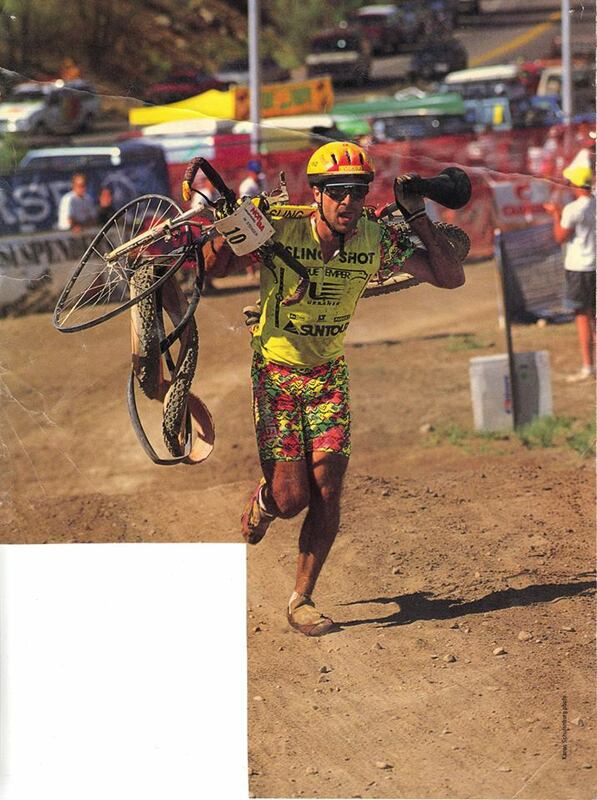 Somewhere in 1990, maybe 91. 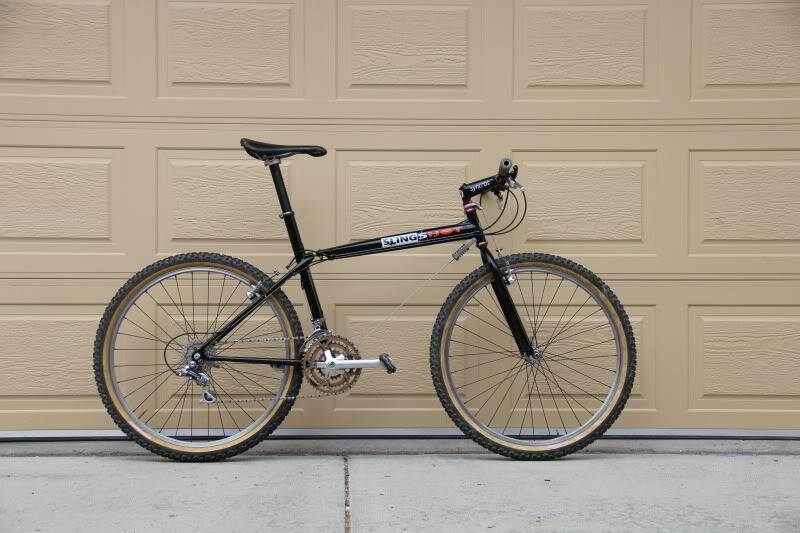 Martin pilot a 1/2 Ti Slingshot, 1993 or 94. 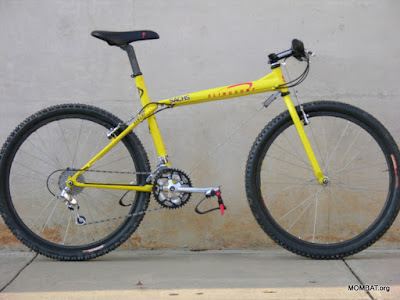 Really want one of those 1/2-ti Slingshots! They really need to start making them again.